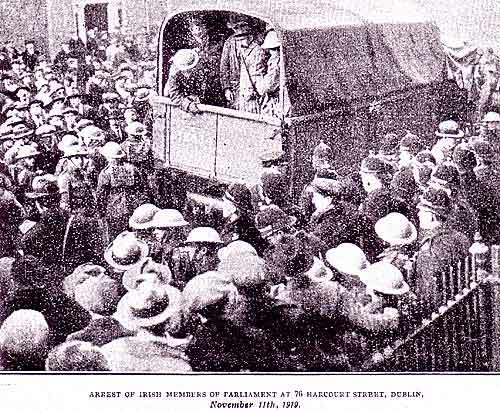 As Brian Murphy points out, on the first Remembrance Day in 1919, Irish elected representatives were carried off to jail. A letter pointing this out sent to the Irish Times of 24th November 2003, but was not published. It remains as relevant as ever and is reproduced below. I note from the Irishman's Diary of Friday 21 November that Kevin Myers has sunk to a new low. From criticising Irish republicans for their opposition to commemorating the dead of the two World Wars, he now criticises two contributors to your letter's page who, while prepared to commemorate the war dead, were not prepared to do so with the same total sympathy for the actions of the British Army in Ireland as himself. Your two contributors were quite prepared to go down the path of forgiveness and reconciliation, the basis of all community commemoration, but that was not enough for Kevin Myers. He wanted them to forget what the British Army had done in Ireland and to rejoice with him that the British Army had prevented the creation of a united Irish republic during the war years of 1919-1921. He also suggested that they should exult with him in the victories of the British Army in Iraq during the same period. Kevin Myers directs our attention to the heroic actions of the British Army in Iraq and as that country has a present relevance, we will do so. It should, in passing, be noted that the boundaries of the state of Iraq were drawn up by the British government in 1921 to serve British interests, including those of the oil industry. The British Army had a major role in acquiring and sustaining the territory that became known as Iraq and, in so doing, they used mustard gas against the Shia rebels who opposed them. In 1922 the Royal Air Force force was encouraged by Winston Churchill to use the same methods against Kurdish rebels because they had had an 'excellent moral effect' when used earlier. Is this the policy of the British Army with which Kevin Myers wishes us to empathise? Here we have the crux of the problem: while asking the people of Ireland to commemorate peace, the British Army and the British administration in Ireland, under the direction of Lord French, Viscount of Ypres, were waging war against the democratic institutions of the country. Is it any wonder that the Irish people should associate Ypres and the British Army with repression rather than liberation? And yet, when Irish republicans announce that they will forgive past wrongs and join in commemorations, Kevin Myers asserts that more is required. Certainly his reputation as the man who has done more than any other person to make it difficult for the many traditions in Ireland to come together in commemorating the war dead is assured.